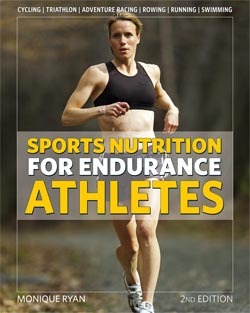 VeloPress is pleased to announce the publication of Sports Nutrition for Endurance Athletes, 2nd Ed., the latest book from nationally recognized sports nutritionist Monique Ryan. The book is now available in bookstores and from VeloGear.com. The science of nutrition can be daunting for athletes, but Ryan converts it to practical advice for smarter eating. Athletes will learn how to assess body composition and find healthy ways to lose body fat and build muscle. Ryan gives a comprehensive explanation of the nutritional role of carbohydrates, protein, and fat in an athlete's diet and explains the importance of meal timing for better performance and recovery. Ryan also explains the concepts of nutritional periodization so athletes can properly adjust their mix of foods throughout the training cycle. The book includes a review of popular ergogenic aids, tips on meal planning, typical shopping lists, sample menus, glycemic index tables, facts about vitamins and minerals, and a comparison of sports nutrition products. Within each sport-specific chapter are tips to adjust nutritional intake for races of different lengths. Monique Ryan, MS, RD, LDN, is a nationally recognized sports nutritionist. She is the founder of Personal Nutrition Designs, a nutrition consulting company based in Chicago. Ryan has worked with USA Cycling, USA Triathlon, the Timex Multisport Team, the Chicago Fire Soccer Team, and many other professional endurance sports organizations. Ryan has published over 175 articles and is a regular contributor to VeloNews, Inside Triathlon, Outside, and ACE Fitness Matters. She is frequently quoted in the New York Times, Chicago Tribune, Runner's World, Fitness, Men's Journal, Men's Health, Her Sports, and Oxygen and has appeared on ABC, CBS, and Fox TV broadcasts. Ryan has published several books with VeloPress, most recently Performance Nutrition for Winter Sports and Performance Nutrition for Team Sports. For more information, please visit www.moniqueryan.com.